One more thing before we get our weekend going.... I've already talked about how much I like eeBoo. I don't think I need to repeat myself but just in case you missed the memo, I really like eeBoo products. They have a couple of new products which showed up on my front door a few weeks ago and with which we've been having a spot of fun with. The first product,Animal Spelling Puzzles , I confess to feeling a bit skeptical about it. Still, it's eeBoo and so I have to give them the benefit of the doubt. These puzzles both mercifully arrived on a day which "we" were a bit under the weather and I needed motivation to keep Bookworm1 in or very nearby the bathroom. We spread these pieces out on the tile floor and went to town. 1. The pieces don't interconnect with one another so I wasn't sure he'd grasp the whole concept after my saying that it was a puzzle. Response: I pulled away the "c" from the word/picture "cow" and said, "Look! Now we've taken away the 'c' and it just says 'OW!!!!'" I added dramatics and he thought it was hysterically funny. After that he took advantage of the fact that the pieces were not attached to one another and make up a whole bunch of silly words which mommy happily read aloud to him. He was exploring letters and sound combinations. He was blissfully ignorant of how blissfully aware I was and so we both had a great time! 2. I wasn't sure how he'd respond to trying to put together numerous three letter words. Response: He wasn't phased at all. These puzzles are perfect for where he is at in letter/phonics recognition and it gave us a jumping off point. 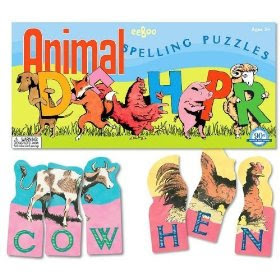 In short, we did well with these Animal Spelling Puzzles and, seeing as the are appropriately themed, we are extra super duper excited about them. Again, I still love the fact that eeBoo makes such sturdy products to be played with heavily without showing signs of wear and tear. My only complaint is that the "G" isn't defined enough and kind of looks like a "C". Instead of making him guess too hard on the "G's" I felt compelled to just tell him what the letter was so as to prevent confusion. Otherwise, no complaints! Next, they also sent Counting Animal Puzzles (a new release, January 2010) which are interlocking and each number is a three-piece puzzle. You'll find the number on it, a correlating number of animals, and the number word spelled out (i.e., "f-o-u-r"). The puzzle pieces lock together well, which is one of the reason I love eeBoo in the first place. Their illustrations are quaint and perfect and have a retro/vintage feel to them which I find visually appealing. We played this puzzle "game" after we played the Animal Spelling one and so Bookworm1 was on a roll spelling things out. He went on spelling and spelling and putting together sounds which I thought was just fantastic. Since I like to practice what I preach, although I was sent the samples above, I really do love eeBoo for their quality products. 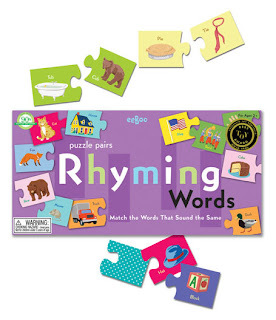 I purchased a set of Simple Puzzle Pairs - Rhyming Words for us to use. We've used this set to match up rhyming words and then followed up by reading quite a bit of Dr. Suess of late! Bookworm1 just loves puzzles and story telling and so any chance I have to combine the two by using them to promote a love of reading - well, you can bet I'm going to take the opportunity! We're doing real well and making very good progress for a three year old! I've no complaints and we're having a good time. Thanks, eeBoo for adding to our fun and being committed to creating excellent products for children and their parents/teachers to enjoy! LOVE those word puzzles. I think that Kyle would have appreciated those. Very fun.